The Red Sox had a ceremony on Wednesday to honor the 1986 World Series team. There’s only one thing wrong with that sentence; that ’86 team LOST the World Series to the Mets in 7 games. We, as Yankees fans, complain an awful lot about the excessive ceremonies the Yankees hold, but last time I checked they have never held a ceremony for a team that didn’t even win a championship. To add insult to injury, Wade Boggs rocked his 1996 Yankees World Series ring during the ceremony. Boggs spent 11 seasons in Boston, where he put up the majority of his Hall of Fame numbers, before signing with the Yankees in 1993. Three seasons later Boggs celebrated the championship he waited his whole career for. By the time 1996 rolled around, Boggs was more of a cog in the machine than a superstar, but he did put up a very respectable .311 average in 132 games. He also had a key walk in extra innings of game 4 of the World Series vs the Braves, a game in which the Yankees came back from 6 runs down to tie the series at 2. The Yankees will be honoring the 1996 World Series WINNING team on August 13, where Boggs can more appropriately wear his championship ring. 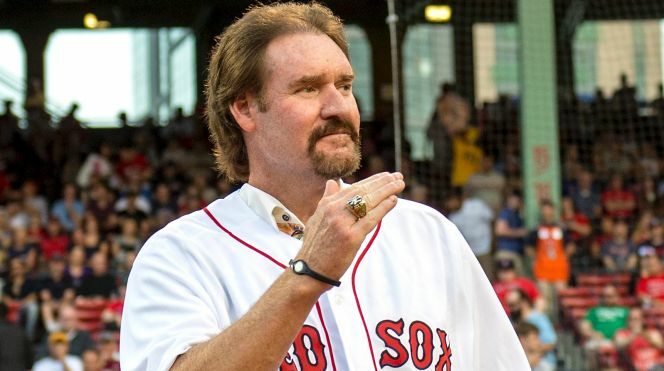 Despite the fact that Boggs is trolling Red Sox fans everywhere by rocking his Yankees ring at a ceremony in Fenway, that is still only my second favorite picture of him.